The Tāj Mahal is a mausoleum located in Agra, India. The Mughal emperor Shāh Jahān commissioned it as the final resting place for his favorite wife, Mumtaz Mahal. Construction began in 1632 and was completed in 1648. The Taj Mahal is considered by many to be the finest example of Mughal architecture, a style that combines elements of Persian and Indian styles. 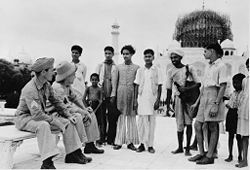 Some dispute surrounds the question of who designed the Taj. A team of designers and craftsmen were responsible for the design, with the Persian architect Ustad Isa usually considered the most likely candidate as the principal designer. While the white domed marble mausoleum is the most familiar part of the monument, the Taj Mahal is actually an integrated complex of structures. Shah Jahan intended the Taj Mahal to be acclaimed by the entire world, and since its construction the building has been the source of an admiration that has transcended cultures and geography. Personal and emotional responses to the building have consistently eclipsed the scholastic appraisals of the monument. The poet Rabindranath Tagore, a Nobel laureate, called Taj Mahal "a drop of tear on the cheek of history." The Taj Mahal is considered one of the Seven Wonders of the Modern World and was listed as a UNESCO World Heritage Site in 1983 when it was described as one of the most "universally admired masterpieces of the world's heritage." This remarkable structure's enduring aesthetic quality results from more than just the expertise of the renowned architects of the age who designed it, or the highly skilled artisans and workers who utilized the finest available materials to build it, for the structure represents a timeless testimony to the love of Jahan for his beloved wife. 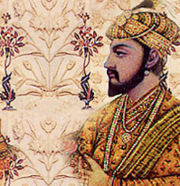 Jahan, emperor of the Mughal Empire during a period of great prosperity, controlled extensive resources. In 1631 his beloved second wife Mumtaz Mahal died during the birth of their daughter Gauhara Begum, their fourteenth child. Jahan was reportedly inconsolable. Contemporary court chronicles contain many stories concerning Jahan's grief at Mumtaz's death; these are the basis of the love-story traditionally held as the inspiration for the Taj Mahal. The Taj Mahal incorporates and expands on many design traditions, particularly Hindu, Persian, and earlier Mughal architecture. Specific inspiration came from a number of successful Timurid and Mughal buildings. These include the Gur-e Amir (the tomb of Timur, progenitor of the Mughal dynasty, in Samarkand), Humayun's Tomb, Itmad-Ud-Daulah's Tomb (sometimes called the Baby Taj), and Jahan's own Jama Masjid in Delhi. Under his patronage, Mughal building reached new levels of refinement. While previous Mughal building had primarily been constructed of red sandstone, Shah Jahan promoted the use of white marble inlaid with semi-precious stones. Hindu craftsmen, particularly sculptors and stonecutters, plied their trade throughout Asia during this period, and their skills were particularly sought after by tomb builders. Whilst the rock-cut architecture which characterizes much of the construction of this period had little influence on the Taj Mahal (carvings are only one form of the decorative element), other Indian buildings such as the Man Singh Palace in Gwalior were an inspiration for much Mughal palace architecture which can be seen on the Taj Mahal. The complex is set in and around a large charbagh (a formal Mughal garden divided into four parts). Measuring 1,050 feet by 984 feet, the garden uses raised pathways which divide each quarter of the garden into 16 sunken parterres or flowerbeds. A raised marble water tank at the center of the garden, halfway between the tomb and the gateway, and a linear reflecting pool on the North-South axis reflect the Taj Mahal. Elsewhere the garden is laid out with avenues of trees and fountains. The charbagh garden was introduced to India by the first Mughal emperor Babur, a design inspired by Persian gardens. The charbagh is meant to reflect the gardens of Paradise (from the Persian paridaeza, a walled garden). In mystic Islamic texts of the Mughal period, paradise as described as an ideal garden, filled with abundance. Water plays a key role in these descriptions: In paradise, these texts say, four rivers source at a central spring or mountain, and separate the garden into north, west, south, and east. Most Mughal charbaghs are rectangular in form, with a central tomb or pavilion in the center of the garden. The Taj Mahal garden is unusual in sitting the main element, the tomb, at the end rather than at the center of the garden. But the existence of the newly discovered Mahtab Bagh or "Moonlight Garden" on the other side of the Yamuna provides a different interpretation—that the Yamuna itself was incorporated into the garden's design, and was meant to be seen as one of the rivers of paradise. The layout of the garden, and its architectural features such as its fountains, brick and marble walkways, geometric brick-lined flowerbeds, and so on, are similar to Shalimar's, and suggest that the garden may have been designed by the same engineer, Ali Mardan. Early accounts of the garden describe its profusion of vegetation, including roses, daffodils, and fruit trees in abundance. As the Mughal Empire declined, the tending of the garden declined as well. When the British took over management of the Taj Mahal, they changed the landscaping to resemble more the formal lawns of London. The Taj Mahal complex is bounded by a crenellated red sandstone wall on three sides. The river-facing side is unwalled. Outside the wall are several additional mausoleums, including those of many of Jahan's other wives, and a larger tomb for Mumtaz's favorite servant. 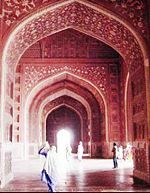 These structures, composed primarily of red sandstone, are typical of smaller Mughal tombs of the era. On the inner (garden) side, the wall is fronted by columned arcades, a feature typical of Hindu temples later incorporated into Mughal mosques. The wall is interspersed with domed kiosks (chattris), and small buildings which may have been viewing areas or watch towers (such as the so-called Music House, now used as a museum). The main gateway (darwaza) is a monumental structure built primarily of red sandstone. The style is reminiscent of that of Mughal architecture of earlier emperors. Its archways mirror the shape of the tomb's archways, and its pishtaq arches incorporate the calligraphy that decorates the tomb. It utilizes bas-relief and pietra dura (inlaid) decorations with floral motifs. The vaulted ceilings and walls have elaborate geometric designs, like those found in the other sandstone buildings of the complex. At the far end of the complex, two grand red sandstone buildings open to the sides of the tomb. Their backs parallel the western and eastern walls. The two buildings are precise mirror images of each other. The western building is a mosque; its opposite is the jawab or "answer," whose primary purpose was architectural balance (and which may have been used as a guesthouse during Mughal times). The distinctions are that the jawab lacks a mihrab, a niche in a mosque's wall facing Mecca, and the floors of the jawab have a geometric design, while the mosque floor was laid out the outlines of 569 prayer rugs in black marble. The mosque's basic design is similar to others built by Jahan, particularly to his Jama Masjid in Delhi: a long hall surmounted by three domes. Mughal mosques of this period divide the sanctuary hall into three areas: a main sanctuary with slightly smaller sanctuaries to either side. At the Taj Mahal, each sanctuary opens on to an enormous vaulting dome. 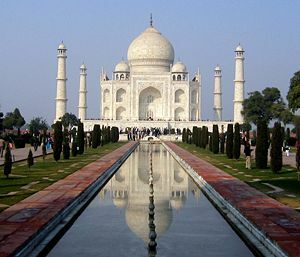 The focus of the Taj Mahal is the white marble tomb. 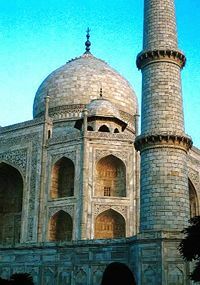 Like most Mughal tombs, the basic elements are Persian in origin: a symmetrical building with an iwan, an arch-shaped doorway, topped by a large dome. The main tomb stands on a square platform, or plinth. The base structure is a large, multi-chambered structure. The main chamber houses the memorial tombs (cenotaphs) of Shah Jahan and Mumtaz (the actual graves are a level below). The base is essentially a cube with chamfered edges, roughly 180 feet on each side (see floor plan, right). On the long sides, a massive pishtaq, or vaulted archway, frames the iwan, with a similar arch-shaped balcony above. These main arches extend above the roof of the building by use of an integrated facade. To either side of the main arch, additional pishtaqs are stacked above and below. This motif of stacked pishtaqs is replicated on the chamfered corner areas. The design is completely uniform and consistent on all sides of the building. Four minarets, one at each corner of the plinth, facing the chamfered corners, frame the tomb. The marble dome that surmounts the tomb is its most spectacular feature. Its height is about the same size as the base of the building, about 115 feet. Its height is accentuated because it sits on a cylindrical "drum" about 23 feet high. Because of its shape, the dome is often called an onion dome (also called an amrud or guava dome). The top of the dome is decorated with a lotus design, which serves to accentuate its height. The dome is topped by a gilded finial, which mixes traditional Persian and Hindu decorative elements. The dome shape is emphasized by four smaller domed chattris (kiosks) placed at its corners. The chattri domes replicate the onion shape of main dome. Their columned bases open through the roof of the tomb, and provide light to the interior. The chattris also are topped by gilded finials. Tall decorative spires (guldastas) extend from the edges of the base walls, and provide visual emphasis of the dome height. The lotus motif is repeated on both the chattris and guldastas. The main dome is crowned by a gilded spire or finial. The finial was made of gold until the early 1800s, and it is now made of bronze. The finial provides a clear example of the integration of traditional Persian and Hindu decorative elements. The finial is topped by a moon, a typical Islamic motif, whose horns point heavenward. Because of its placement on the main spire, the horns of the moon and the finial point combine to create a trident shape—reminiscent of the traditional Hindu symbols of Shiva. Similarly, the spire is made up of a number of bulbous forms. The central form bears a striking resemblance to a Hindu sacred water vessel (kalash or kumbh). At the corners of the plinth stand minarets: four large towers each more than 131 feet tall. The minarets again display the Taj Mahal's basic penchant for symmetrical, repeated design. The towers are designed as working minarets, a traditional element of mosques, a place for a muezzin to call the Islamic faithful to prayer. Each minaret is effectively divided into three equal parts by two working balconies that ring the tower. At the top of the tower is a final balcony surmounted by a chattri that mirrors the design of those on the tomb. The minaret chattris share the same finishing touches: a lotus design topped by a gilded finial. Each of the minarets was constructed slightly out of plumb to the outside of the plinth, so that in the event of collapse (a typical occurrence with many such tall constructions of the period) the material would tend to fall away from the tomb. The exterior decorations of the Taj Mahal are among the finest to be found in Mughal architecture of any period. Nearly every surface of the entire complex has been decorated. Decorative motifs are repeated throughout the complex. Throughout the complex, passages from the Qur'an are used as decorative elements. The calligraphy is a florid and practically illegible thuluth script, created by the Mughal court's Persian calligrapher, Amanat Khan, who was resident at the Mughal court. He has signed several of the panels. As one enters through the Taj Mahal Gate the calligraphy reads "O Soul, thou art at rest. Return to the Lord at peace with Him, and He at peace with you." 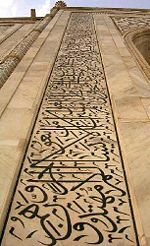 The calligraphy is made by jasper inlaid in white marble panels. Some of the work is extremely detailed and delicate (especially that found on the marble cenotaphs in the tomb). Higher panels are written slightly larger to reduce the skewing effect when viewed from below. Recent scholarship suggests that Amanat Khan chose the passages as well. The texts refer to themes of judgment: of doom for nonbelievers, and the promise of Paradise for the faithful. The passages include: Surah 91 (The Sun), Surah 112 (The Purity of Faith), Surah 89 (Daybreak), Surah 93 (Morning Light), Surah 95 (The Fig), Surah 94 (The Solace), Surah 36 (Ya Sin), Surah 81 (The Folding Up), Surah 82 (The Cleaving Asunder), Surah 84 (The Rending Asunder), Surah 98 (The Evidence), Surah 67 (Dominion), Surah 48 (Victory), Surah 77 (Those Sent Forth), and Surah 39 (The Crowds). Abstract forms are used especially in the plinth, minarets, gateway, mosque, and jawab, and to a lesser extent on the surfaces of the tomb. The domes and vaults of the sandstone buildings are worked with tracery of incised painting to create elaborate geometric forms. The incised painting technique is to scratch a channel in the stone, and to then lay a thick paint or stucco plaster across the surface. The paint is then scraped off the surface of the stone, leaving paint in the incision. On most joining areas, herringbone inlays define the space between adjoining elements. 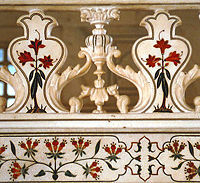 White inlays are used in the sandstone buildings, dark or black inlays on the white marble of the tomb and minarets. Mortared areas of the marble buildings have been stained or painted dark, creating geometric patterns of considerable complexity. Floors and walkways throughout use contrasting tiles or blocks in tessellation patterns. The lower walls of the tomb are white marble dados that have been sculpted with realistic bas relief depictions of flowers and vines. The marble has been polished to emphasise the exquisite detailing of these carvings. The dado frames and archway spandrels have been decorated with pietra-dura inlays of highly stylized, almost geometric vines, flowers and fruits. The inlay stones are yellow marble, jasper and jade, leveled and polished to the surface of the walls. The interior chamber of the Taj Mahal steps far beyond traditional decorative elements. One may say without exaggeration that this chamber is a work of jewellery. Here the inlay work is not pietra dura, a "painting" of colored stone, but lapidary. The inlay material is not marble or jade but precious and semiprecious gemstones. Every decorative element of the tomb's exterior has been redefined with jeweler's art. The inner chamber, an octagon, of the Taj Mahal contains the cenotaphs of Mumtaz and Shah Jahan. It is a masterpiece of artistic craftsmanship, virtually without precedent or equal. While the design allows for entry from each face, only the south (garden facing) door is used. The interior walls are about 82 feet high, topped by a "false" interior dome decorated with a sun motif. Eight pishtaq arches define the space at ground level. As is typical with the exterior, each lower pishtaq is crowned by a second pishtaq about midway up the wall. The four, central, upper arches form balconies or viewing areas; each balcony's exterior window has an intricate screen or jali cut from marble. In addition to the light from the balcony screens, light enters through roof openings covered by the chattris at the corners of the exterior dome. Each of the chamber walls has been highly decorated with dado bas relief, intricate lapidary inlay and refined calligraphy panels, reflecting in miniature detail the design elements seen throughout the exterior of the complex. 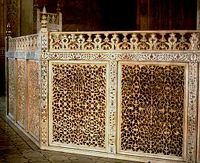 The octagonal marble screen or jali which borders the cenotaphs is made from eight marble panels. Each panel has been carved through with intricate piercework. The remaining surfaces have been inlaid with semiprecious stones in extremely delicate detail, forming twining vines, fruits and flowers. Mumtaz's cenotaph is placed at the precise center of the inner chamber. On a rectangular marble base about 4.9 feet by 8.2 feet is a smaller marble casket. Both base and casket are elaborately inlaid with precious and semiprecious gems. Calligraphic inscriptions on the casket identify and praise Mumtaz. On the lid of the casket is a raised rectangular lozenge meant to suggest a writing tablet. 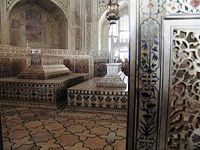 Muslim tradition forbids elaborate decoration of graves, so the bodies of Mumtaz and Shah Jahan are laid in a relatively plain crypt beneath the inner chamber of the Taj Mahal. They are buried on a north-south axis, with faces turned right (west) toward Mecca. "O Noble, O Magnificent, O Majestic, O Unique, O Eternal, O Glorious... " These are only six of the Ninety Nine Names of God, which are to be found as calligraphic inscriptions on the sides of the true tomb of Mumtaz Mahal, down in the crypt. The tomb of Shah Jahan bears a calligraphic inscription, not taken from the Qur'an, but referring to the resting place of this Mughal emperor. Part of the inscription reads; "He traveled from this world to the banquet-hall of Eternity on the night of the twenty-sixth of the month of Rajab, in the year one-thousand-and-seventy-six Hijri." The Taj Mahal was built on a stretch of land to the south of the walled city of Agra that had belonged to Maharajah Jai Singh; Shah Jahan presented him with a large palace in the center of Agra in exchange. Construction began with setting foundations for the tomb. An area of roughly three acres was excavated and filled with dirt to reduce seepage from the river. The entire site was leveled to a fixed height about 50 meters above the riverbank. The Taj Mahal is 180 feet tall. The dome itself measures 60 feet in diameter and 80 feet high. In the tomb area, wells were then dug down to the point that water was encountered. These wells were later filled with stone and rubble, forming the basis for the footings of the tomb. An additional well was built to same depth nearby to provide a visual method to track water level changes over time. Instead of lashed bamboo, the typical scaffolding method, workmen constructed a colossal brick scaffold that mirrored the inner and outer surfaces of the tomb. The scaffold was so enormous that foremen estimated it would take years to dismantle. According to legend, Shah Jahan decreed that anyone could keep bricks taken from the scaffold, and it was dismantled by peasants overnight. The plinth and tomb took roughly 12 years to complete. The remaining parts of the complex took an additional 10 years. Since the complex was built in stages, contemporary historical accounts list different "completion dates"; discrepancies between so-called completion dates are probably the result of differing opinions about the definition of "completion." For example, the mausoleum itself was essentially complete by 1643, but work continued on the rest of the complex. Water for the Taj Mahal was provided through a complex infrastructure. Water was drawn from the river by a series of purs—an animal-powered, rope-and-bucket mechanism. The water flowed into a large storage tank, where, by 13 additional purs, it was raised to large distribution tank above the Taj Mahal ground level. From this distribution tank, water passed into three subsidiary tanks, from which it was piped to the complex. A 9.8-inch, earthenware pipe lies about 59 inches below the surface, in line with the main walkway; this filled the main pools of the complex. Additional copper pipes supplied the fountains in the north-south canal. Subsidiary channels were dug to irrigate the entire garden. The fountain pipes were not connected directly to the feed pipes. Instead, a copper pot was provided under each fountain pipe: water filled the pots allowing equal pressure in each fountain. The purs no longer remain, but the other parts of the infrastructure have survived. The Taj Mahal was not designed by a single person—the project demanded talent from many people. The names of many of the builders who participated in the construction of the Taj Mahal in different capacities have come down through various sources. The Persian architects, Ustad Isa and Isa Muhammad Effendi, trained by the great Ottoman architect Koca Mimar Sinan Agha, are frequently credited with a key role in the architectural design of the complex. The main dome was designed by Ismail Khan from the Ottoman Empire, considered to be the premier designer of hemispheres and builder of domes of that age. Qazim Khan, a native of Lahore, cast the solid-gold finial that crowned the Turkish master's dome. Chiranjilal, a lapidary from Delhi, was chosen as the chief sculptor and mosaicist. Amanat Khan from Persian Shiraz, Iran was the chief calligrapher (this fact is attested on the Taj Mahal gateway itself, where his name has been inscribed at the end of the inscription). Muhammad Hanif was the supervisor of masons. Mir Abdul Karim and Mukkarimat Khan of Shiraz handled finances and the management of daily production. The creative team included sculptors from Bukhara, calligraphers from Syria and Persia, inlayers from southern India, stonecutters from Baluchistan, a specialist in building turrets, and another who carved only marble flowers—37 men in all formed the creative nucleus. To this core was added a labor force of 20,000 workers recruited from across northern India. The Taj Mahal was constructed using materials from all over India and Asia. Over one thousand elephants were used to transport building materials during the construction. The translucent white marble was brought from Rajasthan, the jasper from Punjab, and the jade and crystal from China. The turquoise was from Tibet and the Lapis lazuli from Afghanistan, while the sapphire came from Sri Lanka and the carnelian from Arabia. In all, 28 types of precious and semi-precious stones were inlaid into the white marble. Soon after the Taj Mahal's completion, Shah Jahan was deposed and put under house arrest at nearby Agra Fort by his son Aurangzeb. Legend has it that he spent the remainder of his days gazing through the window at the Taj Mahal. Upon Shah Jahan's death, Aurangzeb buried him in the Taj Mahal next to his wife, the only disruption of the otherwise perfect symmetry in the architecture. By the late-nineteenth century parts of the Taj Mahal had fallen badly into disrepair. During the time of the Indian rebellion of 1857 it incurred defacement by British soldiers and government officials who chiseled out precious stones and lapis lazuli from its walls. At the end of the nineteenth century British viceroy Lord Curzon ordered a massive restoration project, which was completed in 1908. He also commissioned the large lamp in the interior chamber (modeled on one hanging in a Cairo mosque when local craftsmen failed to provide adequate designs). It was during this time the garden was remodeled with the more English-looking lawns visible today. By the twentieth century the Taj Mahal was being more closely cared for. In 1942 the government erected a behemoth scaffolding over it in anticipation of an air attack by the German Luftwaffe and later by the Japanese Air Force (see photo). During the India-Pakistan wars of 1965 and 1971, scaffoldings were erected by the government to mislead would-be bomber pilots. Its most recent threats came from environmental pollution on the banks of the Yamuna River including acid rain occurring due to the Mathura oil refinery. As of 1983 the Taj Mahal was designated a UNESCO World Heritage Site. Today it is a major tourist destination. Recently the Taj Mahal was claimed as Sunni Wakf property, on the grounds that it is the grave of a woman whose husband Emperor Shah Jahan was a Sunni. The Indian government has dismissed claims by the Muslim trust to administer the property, affirming that the Taj Mahal is Indian national property. ↑ International Council on Monuments and Sites, Advisory Body Evaluation, UNESCO World Heritage Centre. Retrieved April 18, 2007. ↑ Building the Taj - Who Designed the Taj Mahal. Public Broadcasting Corporation (PBS). Retrieved June 26, 2007. This page was last modified on 12 November 2015, at 17:10.